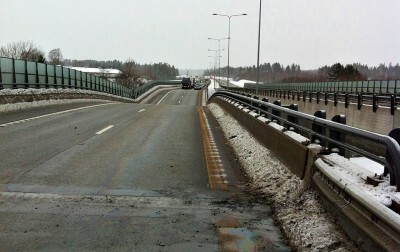 One of the many bridges that make up the four-lane E18 highway through Vestfold collapsed on Monday afternoon. The collapse left around 45 motorists waiting to be evacuated and the highway, which just opened a few years ago, was immediately closed. Emergency crews said it was the bridge over the Mofjell creek at Skjeggestad, north of Holmestrand, that suddenly sagged at around 3pm. Jarle Steinnes, on-duty chief of the fire department serving the area, Vestfold Interkommunale Brannvesen (VIB), said the highway was likely to be closed for a long time. 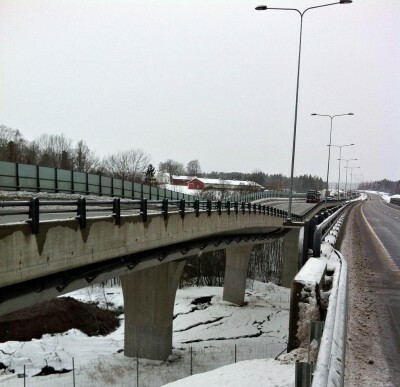 Steinnes told Norwegian Broadcasting (NRK) that a landslide under the bridge left the pillars holding up the bridge “hanging loose in the air.” The ground under them literally gave way. Motorist Bjørnar Gabrielsen, age 35, said he was driving south from Sande to Tønsberg when the car in front of him literally seemed to make a hop down into the roadway. He immediately realized something was seriously wrong. “I was driving at 110 kilometers per hour and tried to brake as quickly as I could,” Gabrielsen told NRK. He said the glass windscreens on both sides of the bridge also shattered. Police said three heavy vehicles, a minibus and several cars were caught at the scene, in the southbound lanes of the E18, but no one was injured. Around 45 people had to be evacuated by minibus. The E18 highway is the main transport artery south of Oslo but “will be closed for a very long time,” Steinnes predicted. That will likely mean major traffic jams again along the heavily trafficked road which always had bumper-to-bumper traffic on summer weekends when it was still a two-lane road. Traffic was being redirected through the city of Holmestrand and it was already said to be heavy.